The Project is named after a Leeds asylum seeker from Angola, who tragically took his own life on 15th September 2005. He fled to the UK after his pro-democracy activity led to attacks on his family, including the murder of his parents. At Manuel’s asylum hearing, his solicitor did not attend and he was forced to represent himself. He did not learn that his claim for asylum had been finally refused, until his removal to a deportation centre. Fearing persecution if returned to his home country, he took his own life, hoping his son would be allowed to remain safely in the UK. • Through our paid and voluntary Immigration Caseworkers who are regulated by the Office of the Immigration Services Commissioner (OISC). These Caseworkers will prepare their clients bundles and represent them in court. • Through qualified non-immigration Legal Teams working pro bono under their own firm’s insurance to prepare the client for their Full Hearing. Our Case Coordinator, Researcher and Host volunteer roles support the work of our Legal Teams at and after our weekly Tuesday Evening Advice Sessions. We do not have the resources to represent these clients in court but we do provide Court Support volunteers who accompany them to provide emotional and moral support. 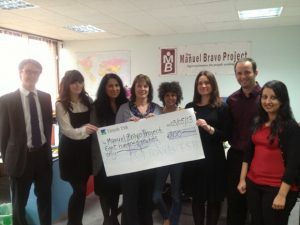 Manuel Bravo Project is a charitable organisation based in Leeds that aims to help asylum seekers who are unable to find adequate legal representation. Our Management Committee is made up of representatives from local and national organisations, churches, ex-clients, and volunteers who work with legal or immigration organisations. The project employs four part time staff and has around 80 active volunteers. • For more information on volunteering or working with the Manuel Bravo Project please visit our Get Involved page. • Our 2015 Annual Report is available here. • Our Ethos Statement is available here. To provide an insight to the kind of work we do here at the Manuel Bravo Project, one of the solicitor teams that we co-ordinate with has kindly written a case study based on an interview with one of our former clients, demonstrating the kind of positive results that we have been able to achieve.